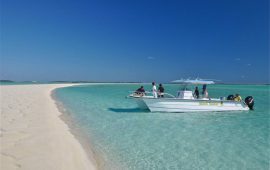 Traveling by boat with family and friends to the countless deserted cays and the most beautiful beaches in the Caribbean is one of the cornerstones of the island experience. 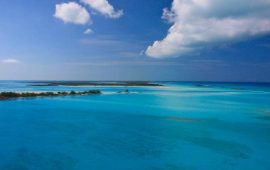 In fact, Exuma may be one of the few places in the world where youll find yourself passing on one breathtaking beach and moving to another simply because a single boat was already there. 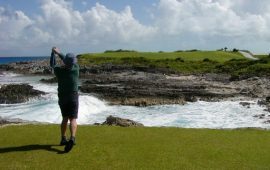 This experience is largely made possible by Exumas expansive soft water natural harbors, which provide wonderful access to so many possibilities without venturing into the open ocean and potential rough seas. Access to moorage, fuel and amenities is also excellent for those seeking multi-day waterborne adventure. Whether with tanks or free diving the reefs and wrecks that fill the waters of the Exumas, the diving is simply far too amazing to miss. Because no rivers exist anywhere in the Bahamas, there is no sediment and no fresh water algae. As long as the winds have been fairly calm, youll likely see fish swimming more than 100 feet away. As far as we can tell, if youre living on an island surrounded by beautiful water this clean clear and teeming with this much life, you might as well dive. Many, many options exist for those not interested in leaping off cliffs, surfing or tearing across a flat on a wakeboard! Just beachcombing, an extremely enjoyable and soulful activity, can be incredibly rewarding with new discoveries around every corner. Best part is, even if you dont find a thing that day, there is nothing wrong with a walk along a breathtaking beach alone or with family and friends. We encourage you to contact us for more information. Or better yet, just come visit. Wed relish the opportunity to show you The Good Life, as one can only communicate so much with mere words and pictures. With such a variety of waters and so much of it, theres no wonder why so many fishing opportunities exist in the waters of Exuma. 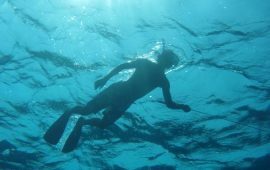 Just minutes from the protected waters of Exumas harbors, the ocean floor drops a few thousand feet providing excellent opportunities for wahoo, tuna, dorado and even marlinall only minutes away from the dock, and a place to grab a burger and a beer. 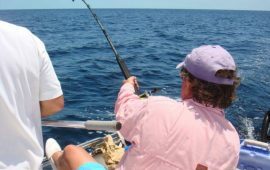 The harbors along the islands east side and the expansive southwest-side flats offer excellent bonefishing, as well as lesser-known opportunities for tarpon and permit. Finally, one should never overlook the fantastic fishing available for snapper, jacks, barracuda, sharks and other species available throughout Exumas waters. Both convenient and some of the most visually breathtaking flying one will ever encounter, dozens of small runways are peppered throughout the varied and beautiful island landscape of the Bahamas Archipelago. After even one flight, you’ll quickly realize flying, like most other things, is just better in the Bahamas. The 7,200-yard, par 72, Greg Norman-designed Oceanside course at Sandals is considered amongst the most challenging anywhere in the world and is, without question, one of the most beautiful you’ll ever experience. At best misunderstood and by-and-large completely unknown, surfing in Exuma and the Bahamas is a quietly kept secret. Population and tourist centers have been, for the most part, located in protected areas of each island and just around the corner one may find the surf break of ones dreams. In fact, every swell that hits the fabled breaks of the north and west shores of Puerto Rico hits the Bahamas first! Here, however, the lineups are empty and the water, crystal clear. We at The Good Life|Bahamas are avid surfers and would love a chance to show you the best breaks Exuma has to offer. 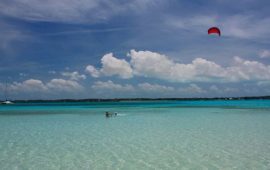 With a water-based activity for every wind/weather condition here on Exuma, endless beaches and protected coves offers acres of smooth water ideal for wake boards, water skis or sea kayaks. Add a little wind and it becomes the perfect location for sailing. Add even more wind and its time to get out the kite or windsurfing boards.